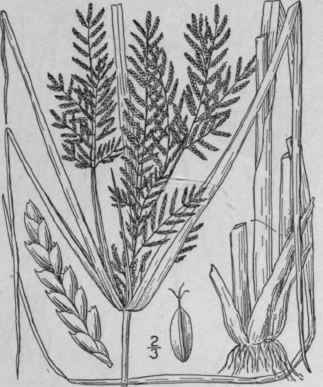 Cyperus compressus L. Sp. PI. 46. 1753. Annual, tufted, culms slender, erect or reclining, smooth, 3'-10' long. Leaves light green, about 1" wide, those of the involucre 2-3, the longer exceeding the spikelets; umbel capitate or with 2-3 short rays; spikelets narrowly lanceolate, acute, 4"-10" long, 1 1/2-2" wide, very flat, many-flowered; scales light green with a yellow band on each side, ovate, acuminate, firm, keeled, several-nerved, falling away from the narrowly-winged rachis at maturity; stamens 3; style 3-cleft; achene sharply 3-angled, obovoid, obtuse, dull, brown, about one-third as long as the scale. In fields and waste places, southern New York to Florida, west to Missouri and Texas. Also in tropical America and in the warmer parts of Asia and Africa. 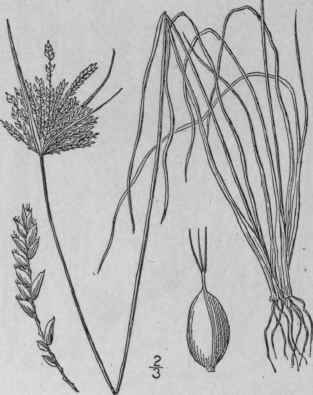 Aug.-Oct.
Cyperus Iria L. Sp. PI. 45. 1753. Annual with fibrous roots; culms tufted, 4,'-20' tall, 3-angled. Basal leaves 1"-3 1/2" wide, shorter than the culm or equalling it, those of the involucre similar, the longer ones surpassing the inflorescence; umbel several-rayed, usually compound; spikelets numerous, spicate, narrowly oblong, 2"-6" long, about 1" wide, flattened, several-many-flowered; rachis marly wingless; scales obovate, yellow to yellow-brown, blunt, mucronate, 3-5-nerved on the back; stamens 2 or 3; achene oblong-obovoid, trigonous, about 1/2" long. Cultivated ground, Hempsted, Long Island; swamps. North Carolina to Florida and Texas. Naturalized from Asia. C. Schweinitzii Torr. Ann. Lye. N. Y. 3: 276. 1836. 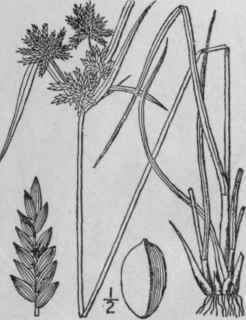 Perennial by the thickened corm-like bases of the culms, tufted, culms rather slender, rough, at least above, 1°-2 1/2° tall, about equalled by the light green leaves. 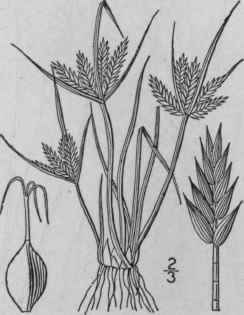 Leaves 1"-2 1/2" wide, rough-margined, those of the involucre 3-7, erect, the longer exceeding the inflorescence; umbel simple, 3-9-rayed, the rays erect, sometimes 4' long; spikelets flat, in rather loose ovoid spikes, which are sessile and at the ends of the rays, linear-oblong, 6-12-flowered, 4"-8" long; scales convex, light green, ovate, acute or acuminate, 9-13-nerved, falling away from the rachis at maturity; stamens 3; style 3-clef t; achene sharply 3-angled, oblong, brown, acute at each end, nearly as long as the scale, its superficial cells quadrate. In sandy soil, especially along lakes and streams, western New York and southern Ontario to the Northwest Territory, Iowa, Minnesota and Missouri. Aug.-Oct.
C. Houghtoni Torr. Ann. Lye. N. Y. 3: 277. 1836. Perennial by tuber-like conns, culms very slender, smooth, erect, 1°-2° tall. 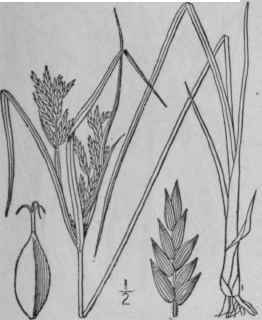 Leaves shorter than the culm, 1" wide or less, smooth, those of involucre 3-5, the longer much exceeding the umbel; umbel simple, 1-5-rayed, the rays mostly short, their sheaths 2-toothed; spikelets loosely capitate, linear, compressed, acute, 4"-8" long, about 1" wide, 11-15-flowered, falling away from the axis when mature; scales chestnut brown, firm, somewhat spreading, shining, oblong, obtuse, truncate or apiculate, strongly about 11-nerved; rachis very narrowly winged; stamens 3; style 3-clef t; achene broadly oblong, less than twice as long as thick, 3-angled, brown, apiculate, nearly as long as the scale. In sandy soil. Massachusetts to Manitoba, Virginia, Michigan and Wisconsin. July-Aug.